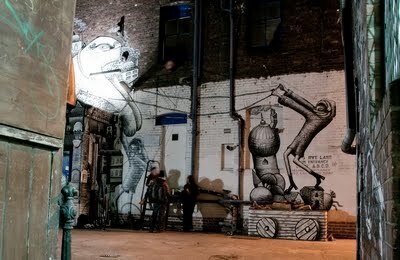 Headed way down South of the river last night, really far south, way off the map to Peckham for this week’s Roa show alongside Phlegm and Robots. 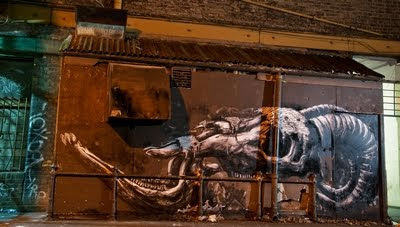 Roa is up everywhere but this was my first encounter with the wizardry of Phlegm. 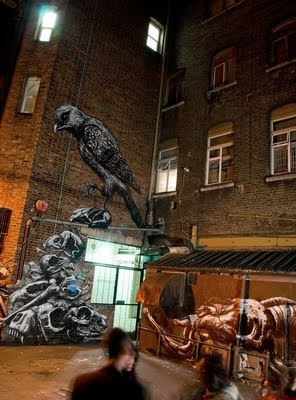 Roa hardly needs introduction, his epic birds and beasts display feathers, veins, innards and bones on many a London Wall. He rarely does small. Plegm however is long established, prolific up North and around the continent but rarely if ever sighted in the capital. 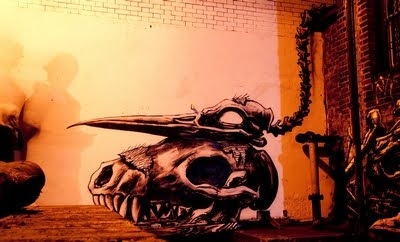 He has a similar monochromatic palate to Roa, he is more suited to older crumbling walls and the insides of derelict buildings, not unlike Roa and it is easily to see why artistically he works well paired alongside Roa. 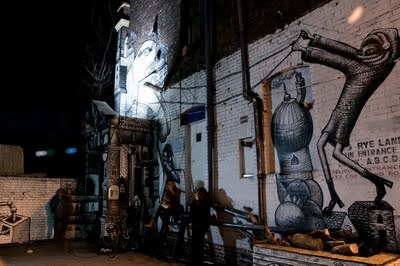 The venue starts with a claustrophobic courtyard at the end of a long passage off Rye Lane. The lumpy and irregular lighting, random shape, the ancient brickwork and the looming tower of a workhouse-like building create a classic environment for these two to populate with enormous beasts, skinny people and a Phlegm trademark wobbly looking glass. The building was “when it was built, one of Peckham’s tallest buildings”, according to the web, a wildly extravagant claim to fame it struggles hard to live up to. Strobing trains rumble past every few minutes making the painted figures leap around the walls like a flickering gothic horror story. Like a bizarre fairytale fabricated to scare the living nightmares out of the kids, this enclosed urban canvas creates the sense one might be trapped inside a walled castle with radiated zombie animals and sundry carcasses for company. Inside the building, 10 flights of footstep echoing institutional stone stairs and through a heavy pair of dog-legged curtains brings you into a blacked out timber floored loft space commandeered by Phlegm and Robots. The door staff offer you hand held torches on the way in, health and safety obviously forbids that you should blunder around in the dark and bump your head. Three coarse built but imaginatively fabricated wooden man-robots spread arms and link hands to tower over the cautiously stepping observers. A Phleg wall painting with an added out-of-scale 3D townscape emits eerie and un-nerving rings and ticks. The town appears to be carried of the back of a Phlegm figure who appears to be cradling a prismatic multi-faceted abstract geometric cloud in his hands. The work of both artists combines in a sinister and yet satisfyingly threatening way. The Robots have more than just a touch of the wickerman about them and the scrawny hooded Phlegm figure looks like a fugitive from a post apocalyptic mutant zone. Neither handheld cameras nor flash photography could convey anything like the mood of this creepy dark installation, so no photos, sorry. Trying to feel your away around this without the torch is recommended, enjoyment and wonder grows as eyes get accustomed to the dark and in the meantime, enjoy the fun of bumping into other timidly tip-toeing creatures. More art experiences should provide this kind of accidental tactile encounter. A note on practicalities, the flyer talks of 4 nights of art, bands and such and apparently you’ll get stiffed with a cover charge in the evenings. It’s not clear if the place is open for free viewing before the ents start. Perhaps email them to enquire because it’s a bloody long way to venture from civilised parts. 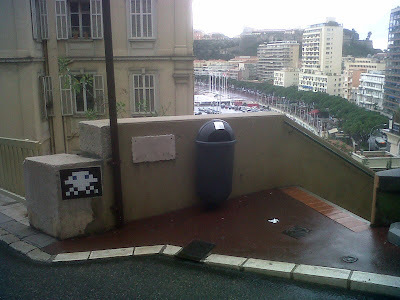 Three or four years ago, I can’t recall precisely when, I spotted an Invader mosaic piece from a taxi as we swept through one of the higher back streets of Monaco. I didn’t have a camera on me and there was little sense in going back. 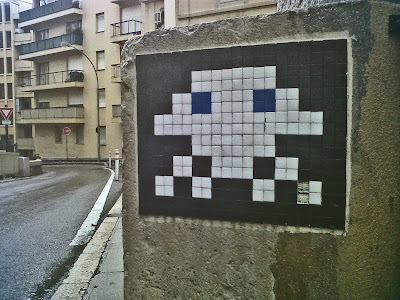 On subsequent trips I brought a camera but the chequered Space Invader was no longer to be found at the spot where I thought I had seen it. 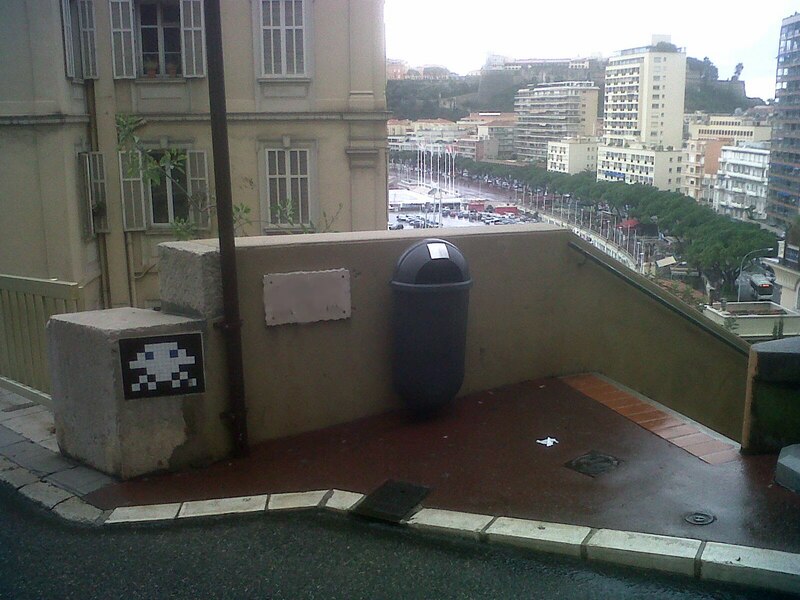 Earlier this week, I climbed up a steep and winding set of alleyway steps from the corner at Saint Devote and emerged into a back street to find the same Invader still there. I was gobsmacked. It turned out that I had been looking for it ever since on a parallel street next block up the hill, a street with the same characteristics of a dropping sweeping downhill left handed corner, but I always went along the upper road, not this slightly lower one. Monaco is a very sterile tightly controlled kind of community, not the sort of place I take much joy in visiting but there happens to be work there. 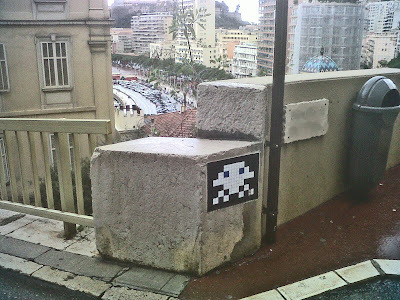 I assumed that the zero tolerance of anything un-authorised by the prince suffered the obvious natural fate of illegal street art in this principality. 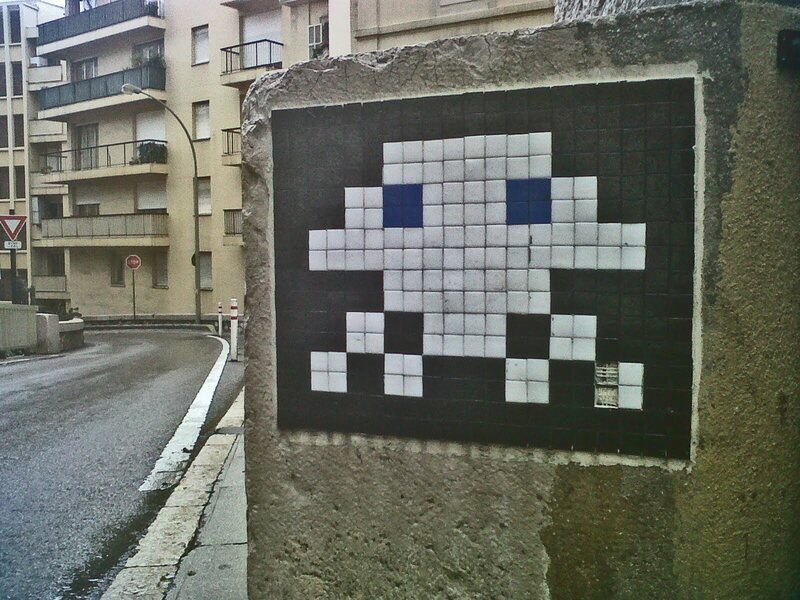 So to find this cheeky little invader still intact now feels just incredible. A quick search on flickr located a photo of this piece dated June 2007 so it certainly has lasted longer than most of its London compadres. The other reason like this is the very deliberate association it has with a chequered flag, who hasn’t heard of the famous grand prix, just about the only Formula One race a non petrol head like myself might bother watching. In the background of this picture, the left right avenue of trees is actually Boulevard Albert 1er which is the straightish start/finish straight for the grand prix, the pit line is just this side of the trees. So, for its contextual referencing of Monaco’s most famous asset and the fact that it has somehow survived this long, I love this little (encore) find.